Whether you call me Saint Nicholas, Kris Kringle, Father Christmas or good ole' Santa Claus, know that I am coming on Christmas Day! While some sourpusses won't agree, children collapse into joy in the Christmas tradition of gift giving and holiday spirit. As Santa Claus, I will tell you all the reasons why children should believe in me. As the one and only Santa, I can confirm that every year children are paralyzed with the joy of Christmas. While ornaments glisten on fresh green leaves, kids dressed in onesie pajamas smile at delicately wrapped presents piled underneath it. Christmas time creates an atmosphere of magical bliss in each household. Allowing children to believe in me can only widen their imagination and ignite a creative drive in their beliefs. We all know baking is tough stuff! Tradition says to leave me a gift of milk and cookies. Children will be learning to bake from an early age. By the end of middle school, they will be baking professionals! Also, there are always extra cookies for the entire family to enjoy. Do you want to be the monster that takes away the pleasure of eating cookies on Christmas day? Let the kids bake the cookies! With adult supervision, of course. Naturally, on Christmas Eve children want to stay up to meet me in person. Let it be known that I won’t come unless the kids are in bed by 9 p.m! Make it tradition, and get rid of your children early every night. You're welcome! Don't get me wrong, I love kids. But parents need to regain their sanity when the kids are home 24/7 for winter break. My elves work tirelessly to make beautiful presents for your children to enjoy, except for the naughty ones. Remind the children: I have a list. Oh yes! After all these years, I still check it twice. If a child is on the naughty list, the child shall receive coal. However, if the child behaves and is nice enough for praise, then they shall be given their ideal present. I will help make the children behave, since their age encourages many mistakes. One of the biggest arguments against my existence is the regret to have the child believe that their parents did not gift them anything and it was all me. However, parents, I have a solution. I will bring the presents to the good children, but you should also be encouraged to buy some for your beloved kids as well. The kids will feel so blessed to have not only Santa look after them, but their parents as well. Santa is one of the biggest Christmas traditions. I want to encourage everyone to make it your own! Santa is one of the biggest Christmas traditions. I want to encourage everyone to make it your own! As an incredible being, I can be anything you want me to be. People often draw me as an old white man. However, I can come in any gender, color or creed — the possibilities are endless! No matter what form I take, know that I can morph, folks. I will be anything you want me to be. 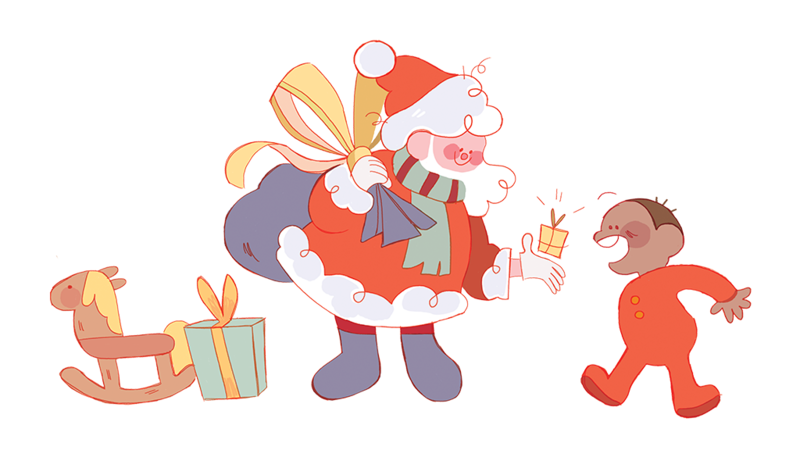 Santa is coming! Heyoo! 2nd-year RIT student, 1st in animation. I am a student-athlete. Also, Korean dramas are my favorite thing. Can RIT become a Division I University? RIT Women's Soccer: On the Way to Championships?